How will the Kings accommodate Varun in the playing XI? Mystery spinners have always been in demand in the IPL. Murugan Ashwin, KC Cariappa are two prime examples of spinners who have made it big at the IPL auction. The latest to join the list is Tamil Nadu's latest spin sensation Varun Chakravarthy. 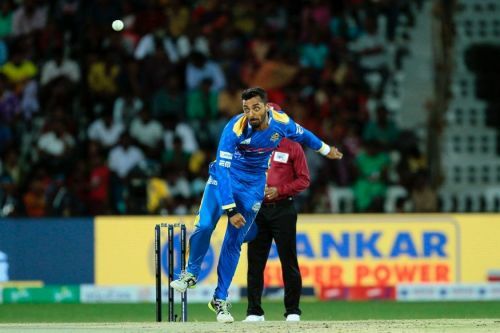 The 27-year-old came into the limelight this year when he took nine wickets in 10 matches conceding runs at an economy of 4.7 runs per over in TNPL. He played a huge role in his team Siechem Madurai Panthers' title triumph. Varun followed it up with a superlative performance in the Vijay Hazare Trophy where he ended up being the second highest wicket-taker of the tournament with 22 wickets in 9 matches. The spinner, who has seven variations in his repertoire, raised a lot of eyebrows when his bid rose as high as 8.4 crores at the auction. Even though Varun looks to be a promising talent, keeping in mind the fact that he doesn't have much first-class experience, the amount of money spent on him might just backfire. Most importantly, Kings XI already have Mujeeb and Ashwin in their squad and it remains to be seen how they will accommodate Varun in the playing XI. IPL 2019: Match 27, MI vs RR Match Prediction: Who will win tomorrow's match?